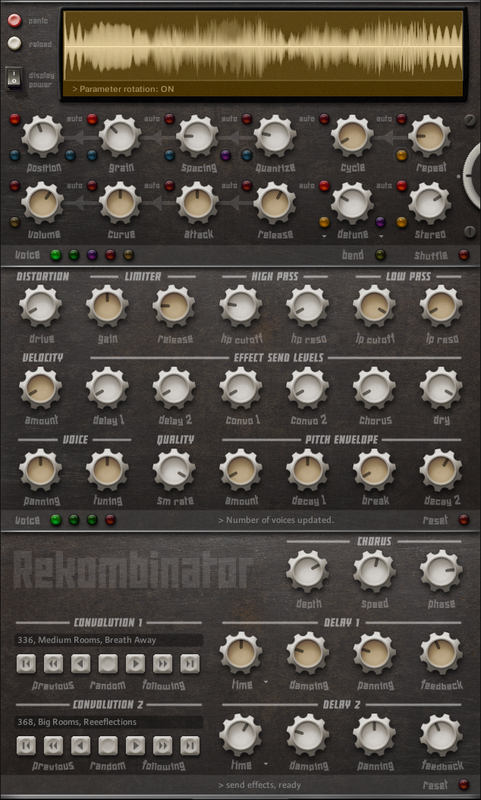 Rekombinator is new instrument/sample shell for Kontakt, I've been working on. It takes a sample, splits it to fragments and re-sequences them to create new sounds. It can restructure drum loops, create evolving drone pads, glitch effects or turn a voice into robotic madness. In short, it's lot of fun. At least it has been for me. This instrument requires full version of NI Kontakt 4.24 or newer and is available at Kontakt Hub. If you'd like to examine detailed description, here's fairly confusing operator's manual in funny English. I'm having a very hard time comprehending how all the pieces fit together with this instrument. I just purchased it from KontaktHub. I love it but just wish I understood what is going on better. I watched all the available videos. I wish there was one video that just explained visually what is happening internally so I could comprehend how everything is connected. Is there any way you might do a basic tutorial video? I've read the manual, but come concepts are not immediately graspable since I'm not that familiar with granular synthesis.